There’s a bit of a story behind this recipe. In high school, when I played ice hockey, we would have pasta parties the night before each game. I forgot to mention one of these dinners to my mother until the day of it. 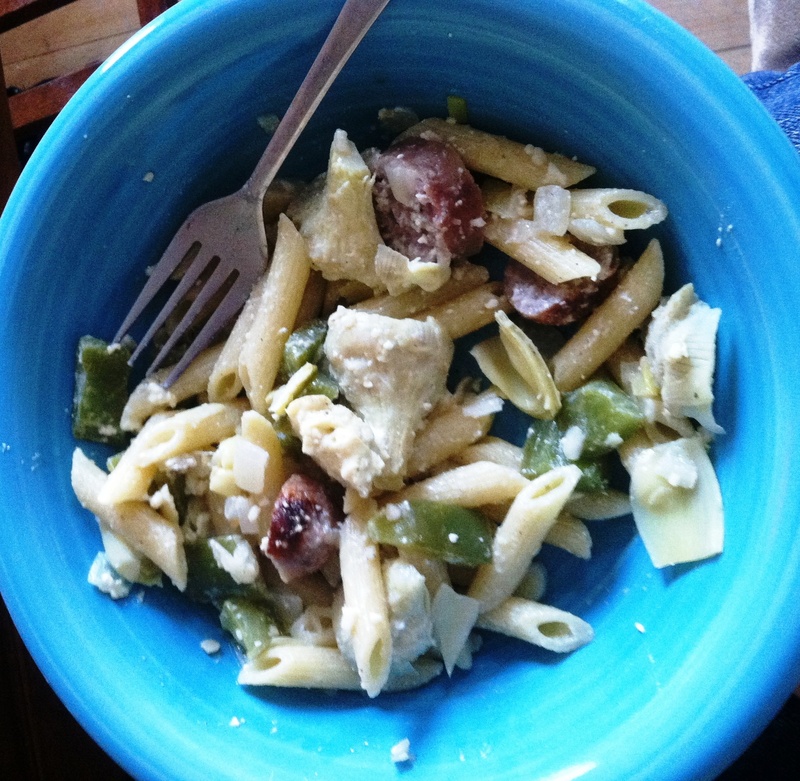 She whipped together a bunch of ingredients to make what we now call hockey pasta. That woman has impressive culinary skills, and it was quite a hit. The second time that I brought it to a pasta party, my coach and his daughter, “number six” (we were all jersey numbers for those four years, even his own daughter, in his own home), drove me home after. I forgot the leftover hockey pasta in their car. When they reached their house and discovered that they were locked out, they sat in the car eating the hockey pasta with their hands until the Mrs. got home. They declared it a delicious lifesaver. Grill the sausages (or bake them on a cookie sheet at 400°F for 20 minutes, until they are brown), and chop them up into Checkers-sized pieces. Chop up, and, in a large pan, saute the onion and pepper in some of the artichoke marinade (if you couldn’t find marinated hearts, just use some vegetable oil). Cook the pasta to your liking, and drain the water. Add the artichoke hearts and their marinade to the onion and pepper. If you chose to include black olives, chop those up and add them. Add in the sausage and penne. Mix in feta cheese to your liking. Let it sit on the stove for a few more minutes. Eat up, me hearties! Yo ho!